Sweet hubby ordered a new dog bed on Amazon to see if our dogs like this style and it’s a little big. But that’s not stopping Leela from claiming it, she’s been parked in it most of the day making sure no one else can get it. She lets Miko or the cats know when they get too close with a threatening growl. 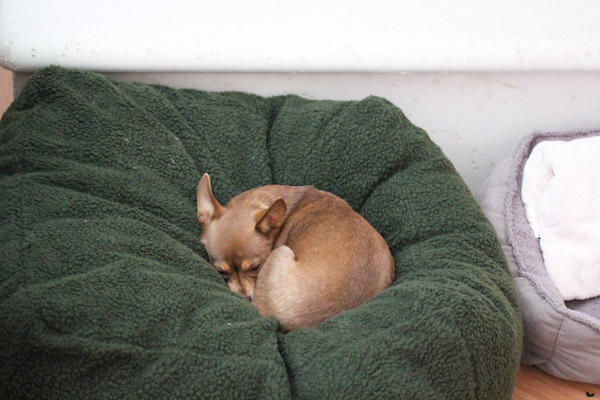 Guess we’ll be ordering another one of these beds soon! But I can’t blame her for staying in bed all day because while the weather was sunny and clear, it’s also been insanely windy. As in knock our patio furniture over and drag it across the patio windy! And knock half of the baby pears out of our pear tree, grrr! 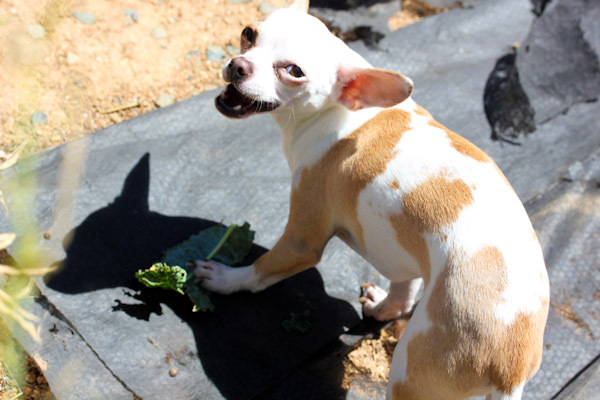 But Miko and I braved the conditions to harvest some kale from the garden. 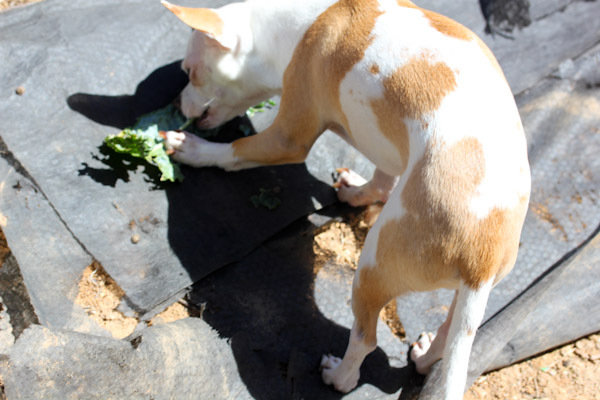 And I just had to share a fresh kale leaf with him, he adores raw kale. And will happily gnaw on the stems. Lovely ground cover, I know. We’re in the process of graveling around the garden beds and the wind was making a mess of the weed barrier. 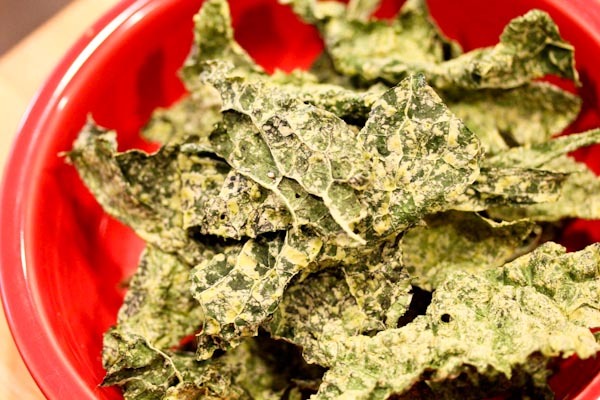 Since it was a great day to stay inside and load the food dehydrator, I was itching to try a new kale chip recipe wich my newly harvested loot. 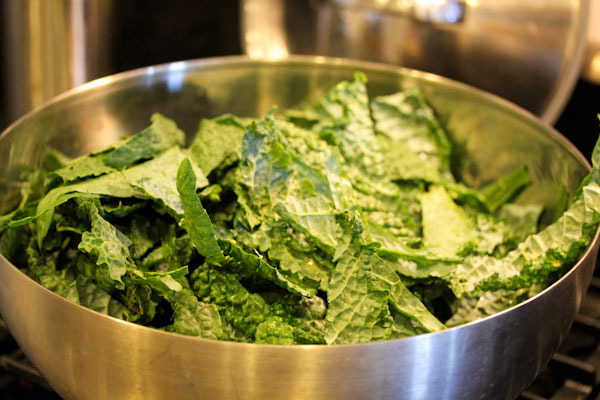 Thoroughly wash and dry kale leaves, then place in a large bowl. 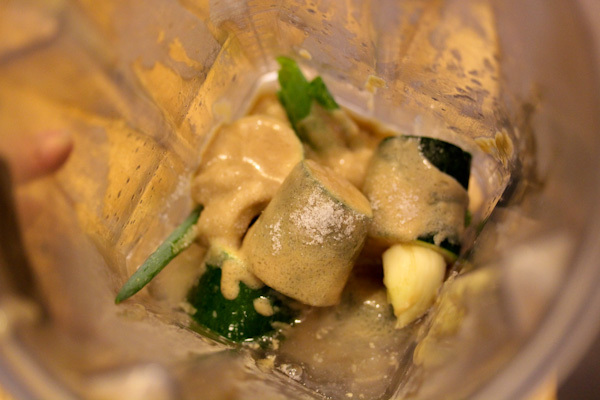 Place zucchini, tahini, garlic, lemon juice, green onions, salt, and water into a high speed blender and blend to a smooth and creamy texture. 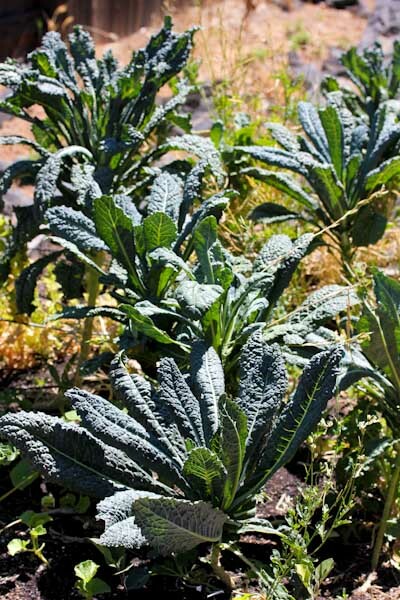 Pour over kale leaves and mix and massage into kale with bare hands or salad tongs. 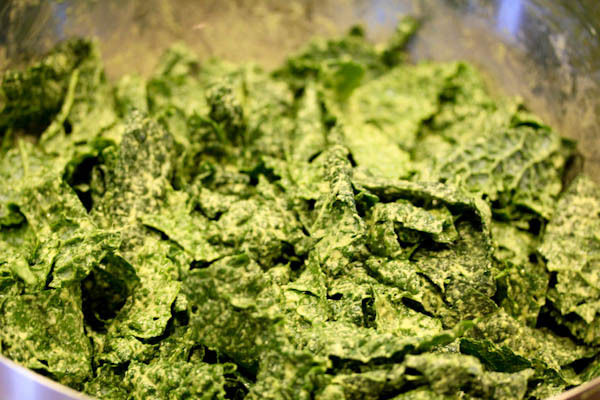 Lay out kale leaves in a food dehydrator and dry at 115 degrees for 4-6 hours, or to desired crispness. Makes one serving … okay it makes about 8 servings. 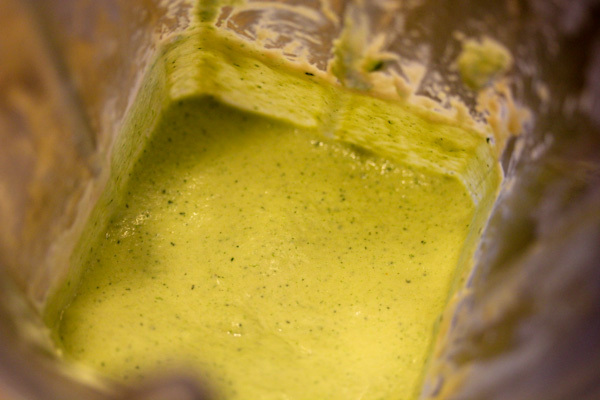 The sauce is very thick and creamy, perfect for coating kale leaves. But it had to be scooped out of the blender over the leaves. Massaging the sauce into the kale leaves with my bare hands was fun and messy, kind of therapeutic. 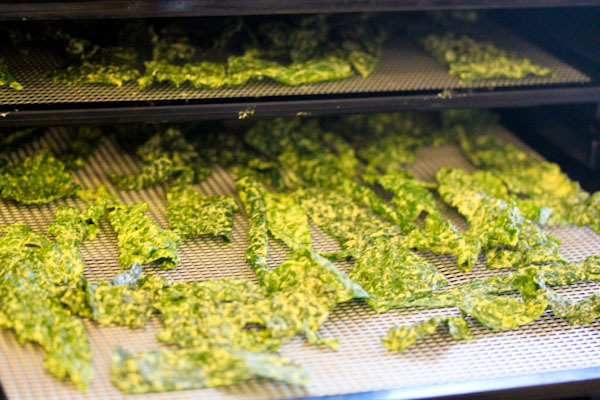 This recipe makes a lot of chips, but I like to load the dehydrator to near capacity when making kale chips since they’re a bit labor intensive and disappear fast around here. 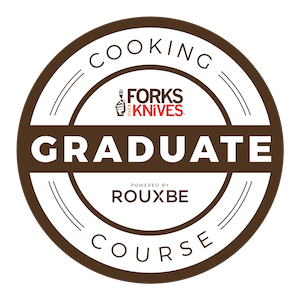 The recipe can be cut in half for smaller batches. The chips came about great, tangy, rich, savory, and very crispy. But also light and airy compared to cashew-based kale chip recipes. If you’re a fan of tahini, hummus, and massage kale salads, give this recipe a try. Yes, I am a fan of tahini, I should try this recipe. Thank you. I have never treid tahii. But this recipe looks devine! I can’t wait to try it.Thanks for sharing! christine your pups are so darn precious! love the pics and love that bed for them. sorry it was so windy-hope it wil be better today! Thanks, the wind finally settled today for a little outdoor time, but yesterday was crazy! 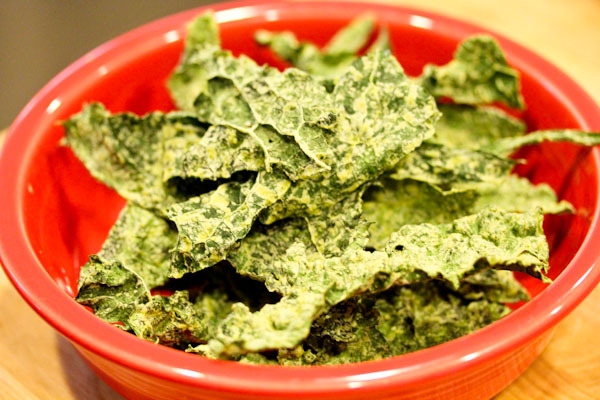 That kale chip recipe sounds delicious, I should try it although I am hopelessly lazy when it comes to dehydrator recipes. I have a question about dogs: your chihuahuas seem so sweet, why does my family tell me not to get one, that they have nasty dispositions? Is this a myth? 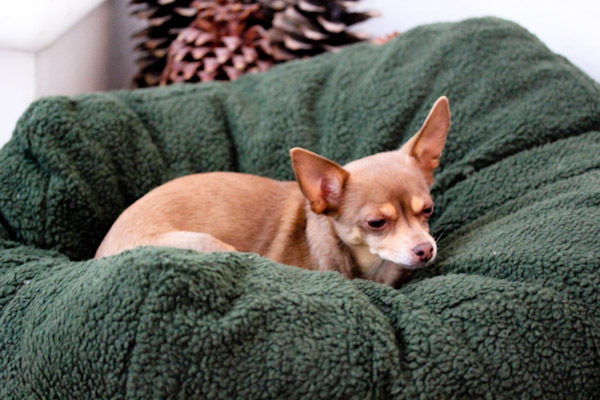 Chihuahuas personalities can be mixed, but they can be known for being snappy and not great with kids. Both mine are rescues and have very different personalities, Leela came from more of an abused past and is very cautious around strangers and kids. Miko seems just happy all the time and loves meeting new people and kids, but he hates it when we leave him. I would recommend adopting a rescued chihuahua because you’ll have an opportunity to see their matured personality first.